From the Pioneer Potato Market in the 1910s to the Clement Street Bar & Grill in the 2010s. 708 Clement Street has been the location of numerous businesses, including the Clement Street Bar & Grill, since the 1910s. - Photograph by John Freeman. As you look around the interior of the historic Clement Street Bar and Grill, it is hard to get a clear fix on what this space has been used for since it was built in 1907. You look at the decorative vaulted ceiling and think maybe this was a nickelodeon or small theater at one time. The bar appears really old, but is it original? The oak face and doors of an old commercial icebox is a confusing element. The fireplace is another flourish that looks nice, but can it be original? None of these puzzling elements are original, nor give any hint to the original use of the building. When this building was built, it was constructed as branch post office Station M. The previous post office had shared space in the building on the northwest corner of 6th Avenue and Clement Street, but with the rapid development of the inner-Richmond after the 1906 earthquake and fire; there was a need for larger quarters to serve the entire Richmond District. This location was perfect for a post office because it was centrally located and had a side access for mail wagons on 8th Avenue, and customer service on Clement. We can only guess that the interior was pretty plain and utilitarian. On the last day of August 1912, the new Station M post office opened on the southeast corner of 10th Avenue and Clement Street in an imposing brick building with full side delivery access. The building at 708 Clement Street's use for the next six years is a mystery until 1918 when it becomes Pioneer Potato Market, owned by John Jacobs, a former saloonkeeper. He sold other vegetables and fruits besides onions and potatoes out of this location. In 1920, a building permit was taken out to build a rear addition that extended out to 8th Avenue. That façade, described as "frontier boom-town" has the address of 281—8th Avenue and still serves at delivery, storage and kitchen extension for the current Bar and Grill, but from 1921 to 1923, was part of the candy factory of James O'Brien, with retail sales on the Clement Street frontage. 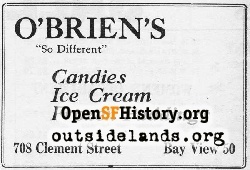 O'Brien's Candy Factory would move to the future site of the Green Apple at 506 Clement Street where he made and sold candies for another decade. Ernest Wilson, an enterprising Stanford graduate, who called his confections "the candy with a college education" expanded his concept of Wilson's Confectaurant to Clement Street, creating a fancier neighborhood sweet shop to include "ices, ice cream, sodas and pastries, serving breakfast, luncheon, afternoon tea and dinner." There is no record of the booths and decorative ceiling were added to the building when Wilson moved in 1923, but the styling indicates it was likely done by either O'Brien or during the pretentious confectaurant era. The building would retain the Wilson's name until 1935, when he filed for bankruptcy, shrinking his empire that extended from Palo Alto, east to Fresno and north to Stockton, but retained a wholesale candy operation in San Francisco for a few more years. 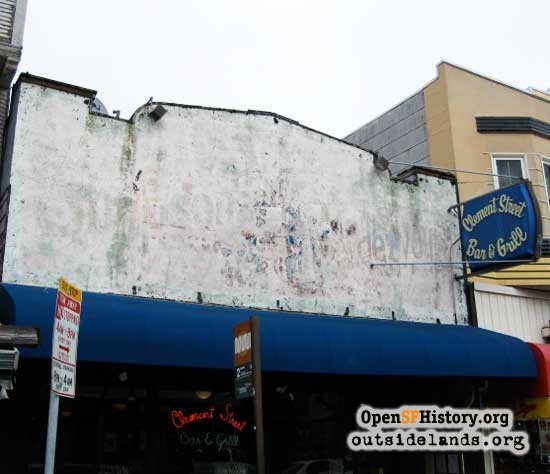 In 1936, neighborhood confectioner and caterer, Louis Simpson added a second operation to his 100 Clement Street candy and sandwich shop, calling 708 Clement, Simpson's Restaurant. 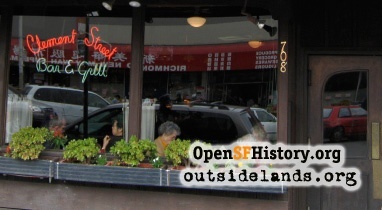 By 1938, 708 Clement Street became Simpson's Rendezvous, a restaurant and cocktail lounge and remained so until 1944, when Simpson consolidated restaurant and catering at 950 Clement Street, on the corner of 11th Avenue. The next tenant was Ted Davis Cocktail Lounge from 1945 to 1949, but then the building reverted back to being called The Rendezvous, occasionally adding "café" to their cocktail designation until 1963, and using the prestigious name Rendezvous Alcohol Catering Co. in the phone book ad. The ´60s and ´70s were the bar, pool table and live music years at 708 Clement Street with names like the Twilight Zone to 1969 and The Clement Mixer until 1975. From 1976 until 1983 the building was called Tevyve's Restaurant & Bar. In those years it was a common sight to see motorcycles parked in a row at the curb on weekend evening and hear blaring music blaring out the doors. 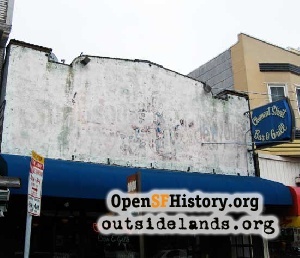 In 2008, during preparations for repainting, the Clement Street Bar & Grill at 708 Clement faintly showed the name of the old Simpson's Rendezvous. - Photograph by John Freeman. 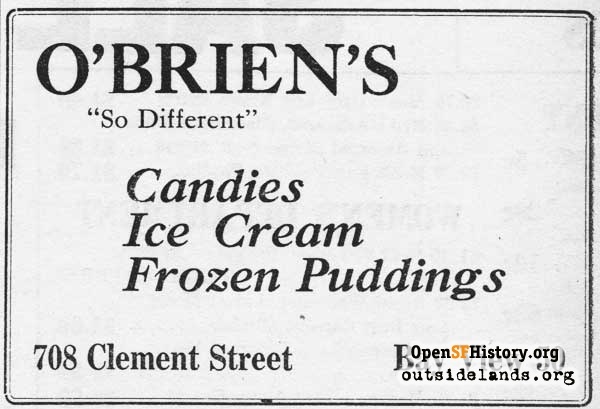 The former post office, produce store, confectionary and prestigious ice cream parlor became The Clement Street Bar & Grill in 1984. Before the Bar & Grill opened, they did extensive remodeling, removing suspended acoustic panels to "liberate" the skylights and vaulted ceiling from the fancy confectionary days. The oak icebox fronts were salvaged and moved forward as a partitian separating the dinning room from the kitchen. The front bar may have been in an unknown saloon and was probably installed 5 years after the repeal of Prohibition when Simpson obtained the first liquor license for the premises. The fireplace appears to have been installed in the 1970s to enhance the restaurant atmosphere. The building has gone through a historic odyssey, but today, the mixture of all these design elements blend together to give The Clement Street Bar and Grill, the look and feel of comfort, continuity and permanence.